My blogging friend Gigi Ross of Kludgy Mom just posted a list of books for boys ages 6-12 to read over the summer. You know, so their brains don’t get all gushy. I’m fortunate because my son still really likes to read at 13 years old. Looking at Gigi’s list was like traveling back in time. I remember when Tech discovered The Big Book of Boy Stuff. His friend Matt gave it to him for 8th birthday. He read it over and over and over again. After I finished reading Gigi’s list, I knew I had to compile a list of my own. After today, Tech is officially a middle school graduate. I know teenage boys are all over the place when it comes to reading comprehension. Please understand I’m sharing these titles not to brag about my son’s reading ability but because I realize it’s challenging to find books for tween-age and teenage boys. Books sit quietly on tables. They’re unassuming, and they have to be awesomesauce to compete with the obvious appeal of all that technology which tries to lure them away. In the summer, it’s even more challenging to get kids to read as tweens and teens become increasingly social, wanting to spend all their time with friends and less of their time with their noses in books. The following titles represent multiple books as each is part of a series. Each book is a minimum of 300 pages and dystopian in theme. What can I say? That’s what floats my kid’s boat. What books have your tweenage & teenage boys devoured more quickly than a bag of Doritos? What titles do you remember reading as a teen? NOTE: If you have boys ages 6-12, be sure to check out Gigi’s post HERE. She also did one for girls ages 6-9. You can read that HERE. Also, if you aren’t following Gigi at KludgyMom, what’s wrong with you? This entry was posted in Education, Summer and tagged books for boys, books for teenaged boys, books for tweenaged boys, Summer Reading. Bookmark the permalink. The Big Book of Boy Stuff? I’ll have to find that at the library for my son. He is really into anything by Gary Paulsen (wilderness stories) and he’s read The Hunger Games this past year. I’ll be sure to check out the other recommendations because it’s like pulling teeth getting him to not play video games. You guys. My son’s 8th birthday is Saturday. I am sooooo gettting him the Big Book of Boy Stuff!! And as I was reading your post, I was envisioning just this plan . . . book time to earn video game time. My son is gonna get some learning this summer whether he likes it or not! Mario Bros. be damned. 😉 Thanks Renz!! Do make sure that you get The Big Book of Boy Stuff and not the Book of Boys’ Big Stuff. Completely different and the latter was very inappropriate for most audiences. I was ashamed of myself for three quarters of my high school life and still won’t shower in front of other guys because of that book. Jordan Sonnenblick’s series on boys growing up is a good one. I’m reading “Zen and the Art of Faking It.” It’s a story of a 13-year-old Chinese-American boy who “adopts” Zen Buddhist principles to impress a girl but learns a little something along with the way. It’s a good book. Maire: I just Googled his name, as I’d never heard of him before. He’s got quite a few books under his belt. I’ll try to lead my kid that way when we go to get him a few books before he heads off to summer camp in 2 weeks. I hate to say it, but I think the cover art looks too babyish for someone going into high school. I’ll let you know what Tech says. I read almost all of the Landmark books and liked Ernie Pyle too. Finished all Arthur Conan Doyle, HG Wells, Edgar Rice Burroughs and James Fenimore Cooper by 16. Hi Carl: I’m hoping to get him into Orwell and Wells this summer. I am not surprised that you loved James Fenimore Cooper, since you are such a history buff. Thanks for the suggestions! I’ve never read any Ernie Pyle. I’ll have to check that out. Thanks for dropping the name. I was reading the Hardy Boys, anything Brian Jacques, C.S. Lewis, JRR Tolkien when I was that age. The Divergent series is pretty darn good as well. As is Fuse (maybe for when he’s a bit older). He never got into mysteries, Eric. It’s such a bummer because the Hardy Boys would have been a natural. Ooooh! I forgot about Tolkien! Need to get that going! I’m sure he’d love all of that dark action. And that’s a trilogy, too, right? Divergent. Why does that sound familiar? Hmmmm. He may have read that. Fuse? That i’ve never heard of. Is it naughty? Should I look into it for this summer? last year (actually every year) in 7th grade we read the Sherlock Holmes mysteries – The Red-Headed League and the Blue Carbuncle and many students reported it was their favorite part of curriculum. We did a lot of the reading in class and then watched the videos to help them piece it together. The both the text and videos (You Tube) are available online. Give it a whirl. Well, you’re popular in my book. Thanks for the great suggestions! Super helpful. I like Choose Your Own Adventure Books and Encyclopedia Brown, but those may have been when I was younger than your son. Of the books I read for high school, I enjoyed Fahrenheit 451 and, once I learned what a Catch 22 was, that became and still is my favorite book ever. I LOVED Fahrenheit 451. Just about anything from Bradbury or Vonnegut. The Hitchhiker’s Guide to the Galaxy was a favorite of mine when a teen. Well, there’s a reason that the sequels were never made into movies. The movie is harder to digest than the books. It’s definitely British, that’s for sure, but well worth the time. And the books are very quick reads. I started to comment this morning on my phone… and then did something and it was all gone. man it was good. I decided to wait until I was on a PC because I didn’t want to throw the phone. I like your list. 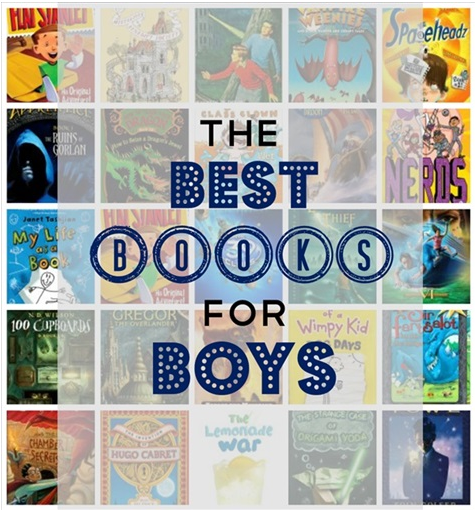 Boy’s reading is so important and there are so many good books out there for boys. Try Jon Scieszka’s Guys Read resources. Also, his book, Knucklehead, is hilarious! Even my reluctant reader couldn’t put it down. I remember reading My Side of the Mountain by Jean Craighead George about a kid who runs away to Catskills and lives in the hollow of a tree. Also, don’t forget non-fiction about stuff boys care about disasters – shipwrecks, fires, hurricanes, and earthquakes as well as conflicts – war (Revolution, Civil War, WWI and WWII, Vietnam and Iraq/Afghanistan). Last summer, my son had to read a book for his freshman English class and he had several choices. He decided to read Sunrise over Fallujah by Walter Dean Myers but in order to REALLY understand it, he needed to read Fallen Angels, also by Myers. I had read both and was able to help fill in the blanks. Both good stories about conflict and how it affects the people who do the fighting. I could write on….. but I won’t. Good luck to Tech (and you) as he enters HS – he’ll have a blast and at the end of the year, you’ll look back with amazement about how much he grew – emotionally, socially, and physically. Clay those are all great suggestions! I TOTALLY remember reading My SIde of the Mountain! I haven’t thought of that in years. I wonder if that’s even in print anymore! Tech has to read Five People You Meet In Heaven as part of his summer reading list. I imagine he’ll finish that in matter of days. It would be really good to have him read some non-fiction, and I’m painfully out of the loop in this area, so I really do appreciate the recommendations. I have girls, but one series my youngest loved that boys would also like is “Redwal”l by Brian Jacques. She just started rereading them this summer and she’s 21! Tech LOVED Redwall! He read it a while ago, but maybe it’s time to revisit it. He hasn’t yet read Watership Down, and it occurs to me it might be time. You know, if he liked talking rodents, maybe talking rabbits will float his boat. Plus, it’s kind of dystopian, right? Thanks Pego-mine! I’m totally out of touch with what boys the age of Tech should read, since even my grandsons are beyond that age, so I’ll take your word for it. I love book lists and wish I had a teenage boy to recommend these to! I’ll check out Gigi’s lists too. Congrats to Tech on his graduation!! I remember my brother loving anything by Paul Jennings (lots of short funny stories) and John Marsden’s ‘Tomorrow when the war began’ series. I’m ashamed to say I don’t know either of those. Must check them out. I’m starting to feel really stoooooopid. Nah they are just both Australian Authors so less likely for you to have heard of them. *wipes brow* Phew! For a minute I was thinking that I REALLY need to brush up on my reading! Those names didn’t even ring a bell! Too bad. Sounds like they’re very good. I’ll have to Google them! Well, to be fair, those books weren’t out when we were tweens and teens. And — confession time — I’m just reading Catching Fire now, so I wasn’t implying you can’t read these books as adults. Good literature is timeless. Very true. Some of my all time favorites are some of the books I read as a girl. The Outsiders will probably always be in my top 10 favorite books of all time. Your 8-year-old will go bonkers for The Big Book of Boy Stuff. If he doesn’t dig it quite yet, he will! I totally remember reading The Secret Seven and Mouse and the Motorcycle books. My son loved those, too. I’m so grateful my son is still reading, but it is definitely more difficult with school and sports — and his new interest in people who are not boys. *ahem* It’s nice to meet you. Coming over to your place to check you out. I checked our library and they don’t have it so I will make a purchase 🙂 LOL on Tech and his new interest in non-boys. I was too shy to act on that interest until about my Junior Year in HS. Sorry – I’m not a writer so you won’t find anything on my site unless you want to read technical info on supplements 🙂 I should have signed my orig comment as long time stalker, first time responder 🙂 Love you and your friends writing! Oh goody! Thanks. I’m always looking for book ideas for my kids. Yay!